International Women's Day this year generated much discussion about gender inequality around the world, and conversations need to continue on this critical subject. It's also important however, to acknowledge the progress made thus far. In particular, I would like to recognize the many contributions made by women in the development and growth of the Internet. I'm asking others to join me in the Internet Society's effort to "Shine the Light" on women who use the Internet to innovate and make a difference --in their families, in their communities and for themselves. Women around the world have made tremendous advances socially, economically and politically, but progress towards gender parity will be stunted if we do not increase the number of women who have access to the one technology that has transformed the lives of billions of people - the Internet. The disparities are evident. Worldwide,there are 200 million fewer women than men online. In developed countries women and men have access to the Internet at close to the same rates, but in the developing world women are 25% less likely than men to have access, and the number jumps to 45% in regions such as Sub-Saharan Africa. Even in rapidly growing economies such as Asia and the Middle East, there are 35% fewer women than men online. This gender gap in the number of women with Internet access can be measured economically--according to the Broadband Commission Working Group every 10% increase in access to broadband translated to a 1.38% growth in gross domestic product-- but equally important, it can be measured socially. Women who have Internet access are more likely to use it in their daily lives. They use their connections to access education, health care, government services and to organize their families and communities for social, economic and political empowerment. With access to the Internet, women in Bolivia learning digital literacy skills can now take part in the online job market, and in India they are creating micro enterprises using the Internet in fields like fishery and sustainable agriculture. The Internet is a powerful tool in the hands of women for organizing their villages, starting new businesses and building local economies. While we know there remains significant work to be done, I believe that women are already empowered to make a difference and to bring about change. We need to highlight their accomplishments and achievements so they serve as a beacon for other women and girls. There is a powerful community of women who are successfully using the Internet to create opportunities and change lives. Many of these women have faced personal and professional barriers, whether they are from a remote village in Pakistan, or an executive for one of the largest technology companies in the world. I like to think of these women as digital trailblazers. Mariel Garcia organizes workshops for young women in Mexico on online privacy. 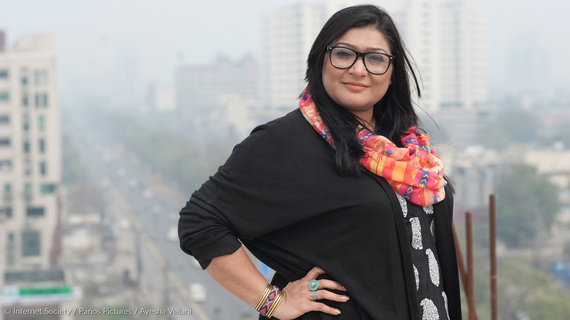 Women such as Nighat Dad, a lawyer and Internet activist who founded the Digital Rights Foundation and included in TIME magazine's list of next generation leaders for helping Pakistani women fight online harassment, and Mariel Garcia who organizes workshops for young women in Mexico on online privacy. Lawyer and Internet activist Night Dad helps Pakistani women fight online harassment.